Many people assumed that it was a take-over of the Antrim based business by the huge Ballymena bus building conglomerate – but it wasn’t. Of course, with Jeff Wright having feet in both camps, there are now very close working relationships between the two organisations. 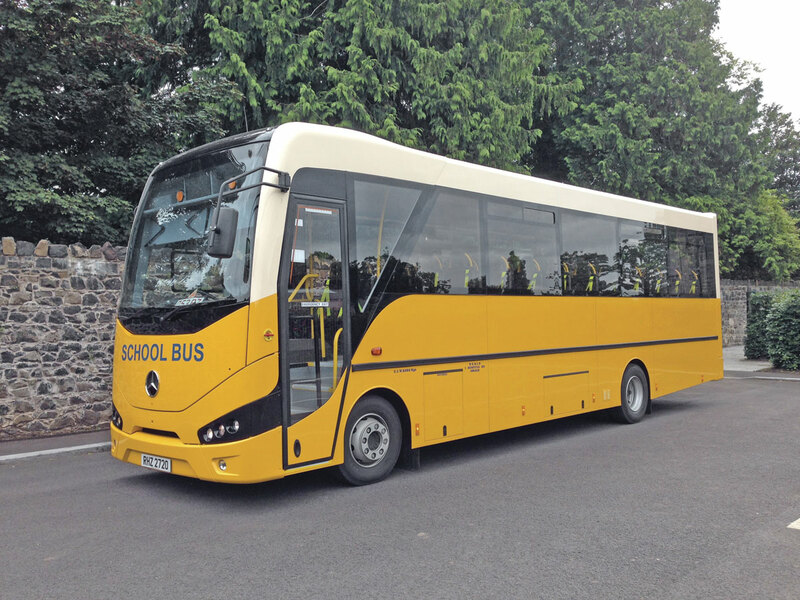 Nu-Track has been building buses, predominantly midi buses, in Antrim for 23 years, having originally been set up in 1991 by Robert McMullan, a former Robert Wright and Son Coachworks employee. 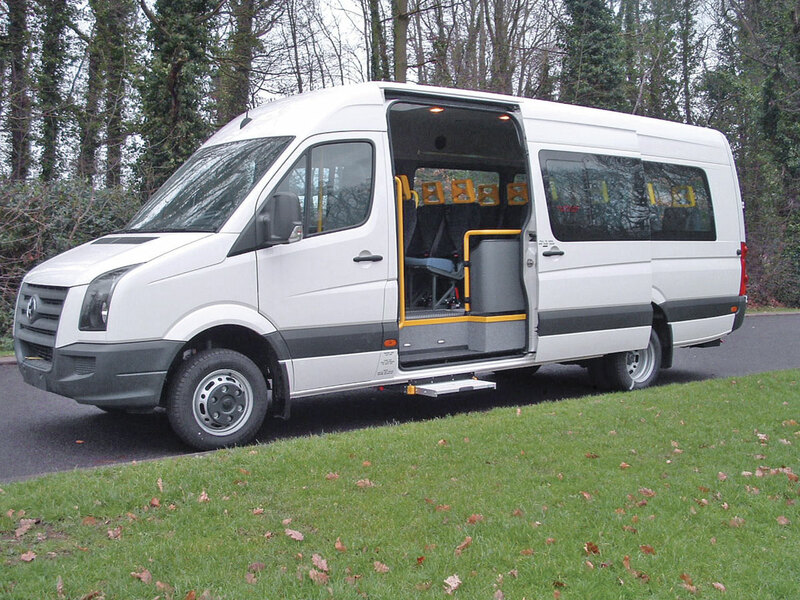 It has specialised in producing accessible coachbuilt midibuses on the Mercedes-Benz Vario chassis. Its principal customers are the hugely powerful Library and Education Boards and the Health Boards in Northern Ireland. These two organisations run large fleets of vehicles. The midibuses built by Nu-Track for the Library and Education Boards tend to be 33 seaters because that is the ideal size for the movement of a class of children plus a teacher. The vast majority of the vehicles are built with tracked removable seating and rear underfloor cassette type tail lifts enabling them to operate on a wide range of duties. Health Board vehicles tend to have a lower seating capacity but still the same flexibility because of their different duties. Primarily these are patient transfers and moving elderly and disabled passengers to day care and treatment centres. In recent times the Health Boards have moved away from the Mercedes-Benz Vario to the Iveco Daily chassis as their preferred vehicle base. 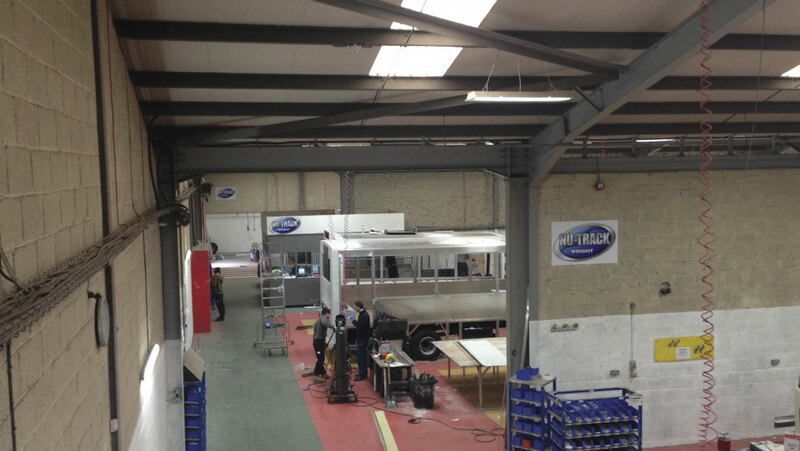 Nu-Track also carries out van conversions on a wide range of vehicles. When I was there recently, Mercedes-Benz Sprinters, Renault Masters and Iveco Dailys were all represented on the build line. Again, many of these are built to be accessible with tracked seating and in-board or rear cassette type tail lifts. However, Nu-Track’s skills don’t end there because they also have a reputation for building much larger vehicles. In the past this included 57 seat 3+2 seating, single deckers on MAN chassis for the Library and Education Boards. More recently they developed the Merlyn, a rear loading accessible coach based on the Mercedes-Benz Atego chassis and have sold quite a number of these to local authorities in the wider UK notably to Redbridge Council in East London. They also build ancillary vehicles, usually on larger truck chassis for use as mobile libraries, computer suites etc. Whilst I was at Antrim I saw a pair of DAF chassis being used as the basis for two mobile libraries. Nu-Track is very much what I would term a traditional vehicle builder. It produces good, strong, reliable, but rather utilitarian, vehicles but as the Merlyns showed, it is capable of flair when given the chance. I think the traditional image of their products stemmed primarily from so much of their business emanating from the Northern Irish Boards where functionality and standardisation were probably of greater importance than design aesthetics. 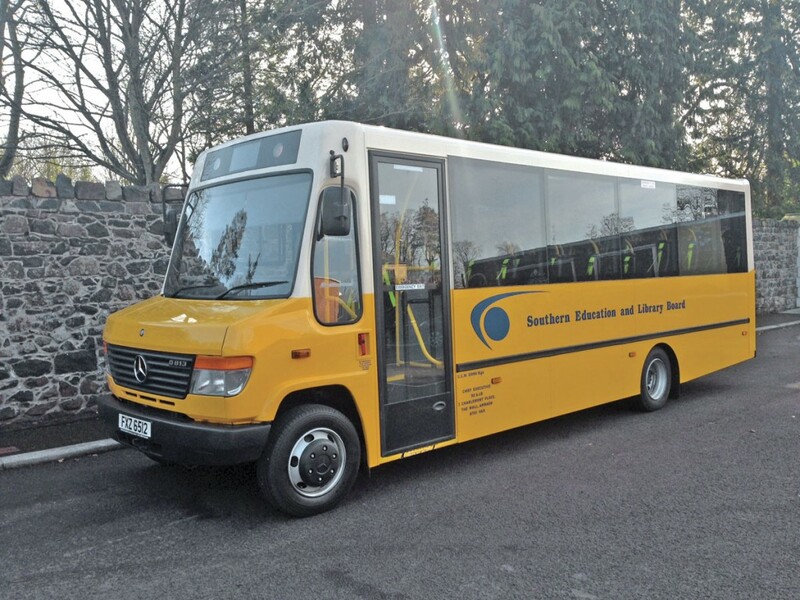 Over recent years Nu-Track has endeavoured to expand its business outside Northern Ireland and has achieved some success with this plan, particularly in Scotland and Northern England where they have sold quite a few minibuses and even mobile libraries. They have also sold some vehicles in the South thanks to an association with Euromotive, the Kentish vehicle converter. Nu-Track has found it tough in recent years due to the economic situation and general reduction in the level of orders and the future of the company was in some doubt. Now all that has changed; since the Jeff Wright acquisition the company has seen a major up-turn in its fortunes. A complete overhaul of the company structure and particularly production processes and methods has seen a massive improvement across the board. Key to this is a new management structure spearheaded by two seasoned Wrightbus professionals, namely, Stephen Francey who is the new Managing Director and John McLeister the Operations Director. Alistair Hammill, a long time Nu-Track employee and the man largely responsible for the development of the Merlyn, has been appointed Engineering Development Manager and another new face is Rob Shiels who is Business Improvement Manager. Rob does not have a vehicle based background but carried out a similar role very successfully for his former employer. Through the efforts of this new team, the whole system for building vehicles has been overhauled. This has allowed greater efficiencies to be achieved enabling substantial cost savings to be made, waste reduced, build times improved and higher quality to be achieved. This in turn has enabled capacity to be raised. At the time of the take-over, Nu-Track was building on average one vehicle a week with a total workforce – shop floor and administration – of 40, now they are achieving between four and five vehicles a week and the workforce has more than doubled and is currently around 90. Not only has this resulted in a major improvement in the company’s financial situation, it has also brought about a major uplift in staff morale. Whereas 12 months ago many of the staff feared for the future of their jobs, now there is a feeling of being in a dynamic, forward thinking company. The transformation is quite staggering. It is perhaps best seen on the shop floor. Nu-Track operates on two sites at the Steeple Lane Industrial Site in Antrim. The two sites are separated by about 50 yards. At the smaller unit chassis cabs are prepared and basic body framing built. The chassis are then transferred to the second much larger unit. I remembered this from my last visit some years ago, as being fairly typical of vehicle builders and converters at that time, fairly chaotic, fairly untidy and with vehicles at various stages of build alongside each other. Now there are clearly defined production areas and everywhere is clean, very clean! There is now a very strict flow line principle with vehicles beginning at one end of the building and progressing up and down the production lines with precise functions happening at each station. All components for each stage of the production are pre-positioned on a just-in-time basis to ensure production runs smoothly. In this way the vehicles move along the lines receiving side panels, roof, fibreglass moulded fronts and rears, doors etc. The vehicle is a complete untrimmed shell by the time it reaches the end of the first of the two production sections. It then goes off-site for painting. Currently Nu-Track does not have facilities to paint its own vehicles and this is carried out locally by a sub-contractor, but the work is closely monitored by the Nu-Track team. Throughout the build process, the vehicle is continually quality audited by the Quality Manager, Richard Bolton and the Production Supervisors, Simon McCartney, Rab Cupples and Paul Kirkwood. All four men were promoted from within and have years of experience behind them. They have transformed the quality of build, since they took the roles on last year. Part of the reason for this is the adoption by the company of a personal responsibility culture. Under this scheme, used by some other leading vehicle builders, individuals or teams carrying out stages of the build process are held responsible for the quality of their work. If the correct quality is not achieved then they have to carry out the necessary rectification work for which they do not receive extra pay and they have to do it in their own time. The adoption of this procedure has seen a drastic reduction in quality related problems, an increase in build efficiency and a major rise in pride and ownership of the job. The use of a competitive element between the various build groups breeds a culture where everyone is trying to achieve 100% quality audit every time. When the vehicle returns from paint it enters the second production phase which again operates on the flow line principle. Here the vehicle receives all the external and internal trimming. 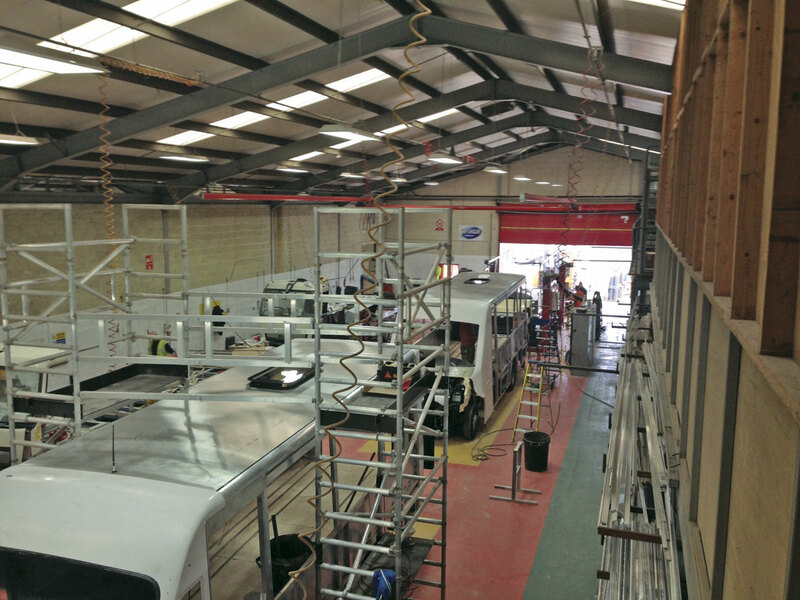 This includes glazing, internal trim, seats, flooring, lighting, heating, racks, tail lifts etc, until the vehicle reaches the end of the line fully completed. Again, in this area the just-in-time principles are used as are the same quality audit procedures. At the end of the process the vehicle is fully checked and audited and valeted ready for release to the customer. 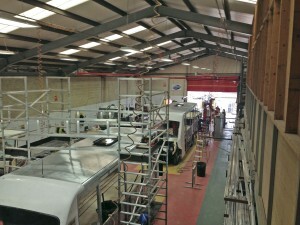 A separate section at the far end of the building is devoted to van conversion work. This has its own dedicated build team. Here, more traditional build techniques are used with teams responsible for individual vehicles. The same quality audit processes and personal responsibility are also practised in this section. Another change in the culture at Nu-Track has been the introduction of workforce involvement. Everyone is now involved in the process. Every week the build teams and the management meet to discuss what has been achieved, any problems identified and the programme for the forthcoming week. These are free interchange sessions where everyone is encouraged to contribute, especially any ideas that make production easier, save time or cost or improve the product. These again reinforce the ‘ownership’ culture. As John McLeister said, ‘These guys are doing the work day in, day out, they know better than anyone when something can be improved or will save time or cost – we’d be foolish not to listen to their input.’ The scheme has been shown repeatedly to be time well spent. John is passionate about maintaining the skills base. ‘We offer our workforce the opportunity to constantly upskill as exemplified by the Quality Audit Manager and the Production Supervisors having been drawn from the shop floor. We constantly keep them abreast of new production systems and techniques’. John explained that Antrim is an area with a good core skilled workforce. Whilst recruits may not have previously been involved in vehicle building, their base skills means re-training is relatively simple. John is also enthusiastic about training youngsters and the company usually has around seven apprentices on its books. This is all very important to the company’s forward plans which are to grow the business substantially both by widening the product offering but more importantly by raising its share of the wider UK and Irish markets. The company is on the look-out for a new production base where it can bring all of its activities together on a single site. Preferably this will still be within the Antrim area. As I said earlier, much of Nu-Track’s production has been based on the Mercedes-Benz Vario but now the Vario is no more. Nu-Track were quite astute over the end of the Vario and managed to secure a sizeable batch of chassis before production ended. The very last of these was going through the build process when I visited. They also have a sound on-going base working on the Iveco Daily and that will continue going forward. At last year’s Euro Bus Expo Nu-Track sprang a major surprise by showing a prototype of a new flat floored, directly wheelchair accessible, minibus. The vehicle, perhaps not surprisingly, is based on the Wrightbus Streetlite concept using a rear mounted Cummins engine and automatic transmission. The prototype has been on demonstration trials over in England and the results have been very encouraging. Two further demonstrators are currently being built in the development area which occupies part of the building where other vehicles are framed. The first will be an 8.8m version, probably with seating for 33, but retaining the Nu-Track principles of adaptability to carry wheelchairs by being fitted with removable seats and seat tracking. The second demonstrator will be a 9.5m version. Going forward, the idea is to develop further variants using the Streetlite base concept. These could include shorter versions and higher floored versions for those that continue to require rear wheelchair loading rather than side loading. For many operators rear loading remains important because of restricted accesses which make side loading either difficult or impossible. Naturally, at this stage, the Nu-Track team are playing their cards very close to their chests and details are very sketchy. We will have to be patient and see what transpires in the coming months, but I guarantee it will be interesting and surprising. The use of the Streetlite base makes a lot of sense, in part because the new Wright Group En-Drive facility, which builds the chassis for many of its vehicles, is also in Antrim, just down the road from Nu-Track! In the last year there has been a total transformation at Nu-Track. There have been massive changes and there are many more to come. There is a whole new buzz about the place and I predict it is a name we are going to hear a lot more of going forward.